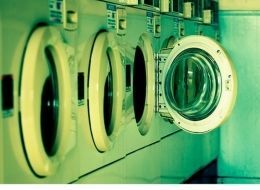 Doing the laundry can use a lot of water and energy, and typical detergents aren't the most eco-friendly thing either. But there are ways to make your laundry endeavors keener and greener! -When washing machine shopping, look for washers (and dryers) with the Energy Star logo. A lot of older appliances can eat up a lot of energy. This goes for all appliances. When we replaced our old fridge with a new Energy Star one, our electic bill went way down! -Make your own detergent! Being on the cheap frugal side, I would often go to Costco and get a huge container of some generic industrial detergent. Who knows what the ingredients are in that, and how good could it be for your skin? However, making your own detergent is an even cheaper way. TipNut has 10 great recipes for making your own detergent. These recipes are so easy and they can cost as little as pennies a load. The ingredients and recipes are so simple. You can even make them smell good by adding essential oils, such as lavender. -Read the detergent labels before buying store bought detergents. Kids-Going-Green.com says to avoid: butyl cellosolve (dangerous toxic chemical), petroleum, triclosan, phosphates and chemicals called as phthalates that are used in fragaranced detergents. Just because a detergent says it's natural doesn't necessarily mean it's non-toxic. -Wash everything in cold water. -Use dryer balls instead of dryer sheets. They work just as well as fabric softener, but they're reusable. We use Nellie's Dryer Balls. There are lots of other great products on the Nellie's site that can help you "green up" your laundry habits. -Let your clothes air dry. Get a clothesline and on nice days, let your laundry dry outside. Drying racks are another option. You can even keep them in your home and let them dry out there. Green Cotton also recommends drying your laundry on your radiators in the winter. In places like Massachusetts, where I live, it can add some much needed moisture into the air in the dry winter climate. -Wear your clothes more than once. As long as they aren't stinky, of course. But even if you spill a little something on to your shirt, spot clean so you don't have to wash the whole thing.